Behavior therapy focuses on the child, but what about the parents? As providers, we tend to make applied behavior analysis (ABA) about the child. During therapy sessions, we decrease problem behaviors and teach the individual new skills. But while these are both great, the unfortunate fact is that parents and caregivers get left behind. After picking up their child from therapy, parents often struggle with the same problem behaviors at home. And while parent trainings are meant to teach parents the concepts of ABA, we often end up with progress reports instead. One of the things I struggled with the most was managing my expectations for parents. I would set goals, but they would often be unrealistic. When I realized this, I had to backtrack to find a way to set parents up for success. I began writing SMART goals to hold myself accountable when teaching ABA concepts to parents. What if I told you there’s a way to keep your main focus on the child, teach parents how to implement basic ABA strategies, while also measuring and tracking parent’s progress? Roadmap to ABA parent training is a simple program designed to keep you and the parent on track with realistic goals that you can tailor to fit your schedule. Materials that are easy-to-read, yet jam packed with information. Set of goals written to supplement the Parent Guides and measure the parents' comprehension. Make SMART goals actionable by guiding parents and providing opportunities to demonstrate the concepts. 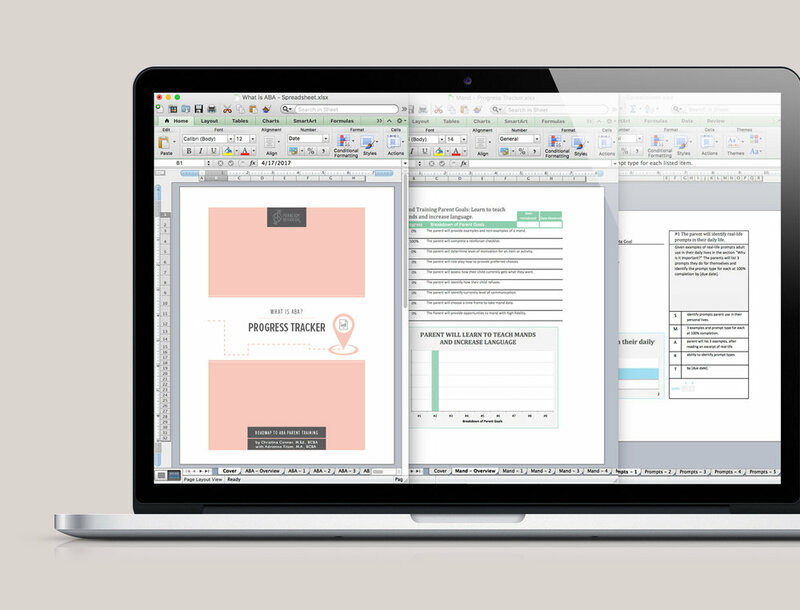 An automated spreadsheet, in Microsoft Excel, to graph the parents' progress toward their goals. Since the release of Roadmap to ABA Parent Training, I have collaborated with Adrienne Fitzer, MA, BCBA after introducing myself at ABAI 2017 in Denver. I told her that her article inspired me to create the Roadmap with the SMART goals. She has helped provide her insight and expertise to make the guides more user-friendly and more effective for both trainers and parents. She has proven an invaluable resource as both a mentor and collaborator as we’ve refined the Roadmap. The updated edition of What is ABA? and Prompts is complete and now available for purchase. Adrienne Fitzer, MA, BCBA, is the owner of The Applied Behavior Analysis Center (ABAC), an online education center, and has co-edited two books on ABA and autism. She holds a Masters Degree in Psychology and is currently pursuing her doctorate. Are you ready for a better way to parent training? With the Roadmap to ABA Parent Training, you can do #allthethings necessary to improve the child’s quality of life without stressing over the materials or falling behind. You are doing great things here! And with Roadmap to ABA, you're able to "pick up where you left off" from your last parent session and make every minute count. Maximize therapy services before they're gone. Unfortunately, families may not always have access to ABA services. Whether due to insurance polices or a variety of other reasons, coverage for ABA is not guaranteed. Roadmap to ABA Parent Training allows parents to make the most of ABA services and continue to realize the benefits even if therapy is no longer available. Make realistic goals toward learning the concepts in every parent meeting. Often we attempt to teach parents ABA concepts by assigning "homework," that gets pushed aside when life gets in the way. With Roadmap to ABA Parent Training, you'll be given a plan designed to teach parents ABA concepts in bite-size lessons. These plans also translate to the parents' daily routines, making them actionable while also allowing parents to see real results. by teaching parents how to carry over the same behavior concepts to their home. Remember, the goal is improving the child’s overall quality of life, not just during therapy. When we provide the basic tools of ABA, parents are able to see behavior changes that last and have a real, positive effect in their day-to-day lives. Graph with automation using the Progress Tracker aligned with SMART goals. *Please keep in mind that because our products are distributed digitally, it is Paradigm Behavior's policy that all sales are non-refundable. Parents will learn the ABCs of behavior and how to write behavior in observable and measurable terms. The Parent Guide offers insight on the importance of understanding behavior patterns and how we teach new skills. Approximately 5.5 hours of parent training with 10 parent goals addressing observable behavior, choosing a target behavior(s), how to measure behavior, data collection and identifying components of discrete trial training (DTT). *What is ABA? now includes updates with Adrienne Fitzer, M.A., BCBA. Parents will learn to teach their child to consistently request for things they want at home and replace problem behavior relating to "getting what they want." Approximately 5 hours of parent training with 10 parent goals addressing motivation, current communication abilities, providing opportunities to role-play with parents and commit to increasing requests at home. Learn to use prompt types to increase independence when teaching a new skill. 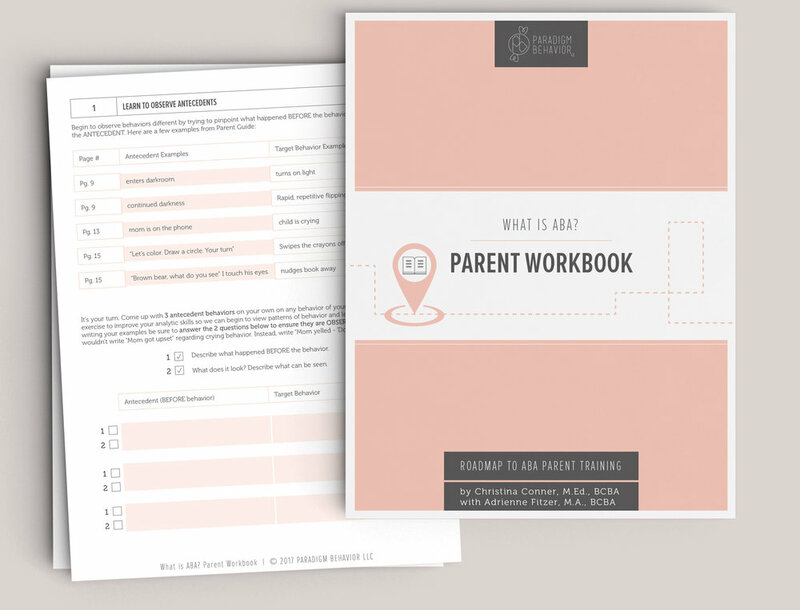 Approximately 5.5 hours of parent training with 9 parent goals offering flow charts and role-play opportunities for parents to work with trainers and learn how to prompt at home. *Prompts now includes updates with Adrienne Fitzer, M.A., BCBA. My name is Christina Conner, and I’m a Board Certified Behavior Analyst. Throughout my career as both a BCBA and an ABA therapist, I’ve had the privilege and opportunity to work with families from all walks of life, both in-home and in clinic, and I’ve experienced firsthand many of the challenges faced by families who have loved ones with special needs. I started Paradigm Behavior because I understand the need for parents to integrate ABA concepts into their lifestyle without becoming ABA therapists themselves.